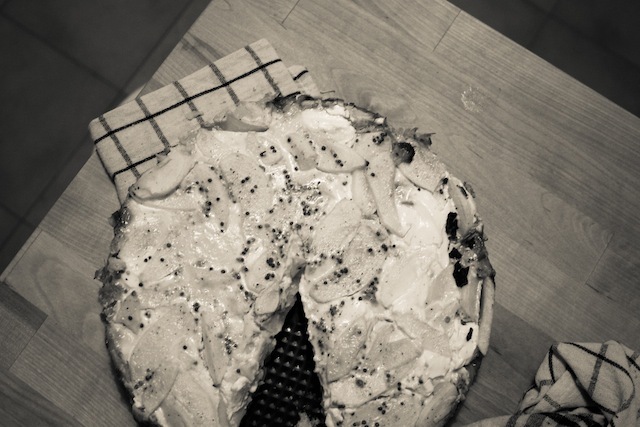 The Arrival Poems: Berliner Leek and Apple Tart – Eat Me. Drink Me. It seems to me that New York is a story about leaving a place you love and Berlin is a story about arriving in a place you come to know. Where we are or where we live is never as simple as choosing what we love. It can be right to live in a place we don’t care for and wrong to live in the place that knows us best. An apple in my hand. Slick knife flicks away the skin and slices quarters. Scooping out seeds and hard-pearled seed beds. My knife slowly slices thin slivers to lay them in lemon juice, the lemon already snipped in two. My Berlin poems and my New York poems speak to each other. They have to. Their medium is me, my lived experience, my understanding of my world. Without knowing it, when I was in New York, I was always writing about leaving it. How strange to feel so vividly what arriving is. I am arriving in a city I will not stay in. A quick whisk dips in egg and cream, seeded mustard, hot cayenne and brittle nutmeg. The smooth sauce poured over these layers: Bed of dough pronged by a fork prick, mouth-soft leek and sage, slips of goat cheese, lemoned apple slices. 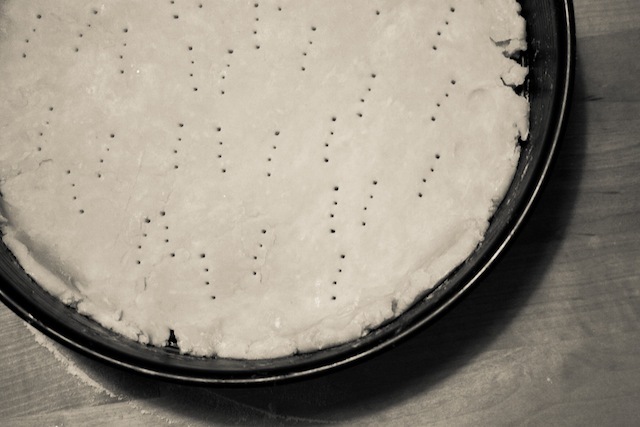 Nubs of mustard seed dot the tart’s top. For now I’m here. I’ll write my way into this place. This tart is frankly phenomenal. 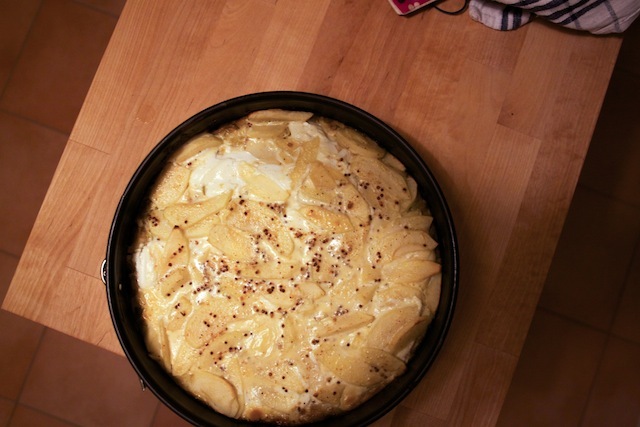 It’s a traditional Berlin recipe, in German known as “Lauchkuchen mit Äpfeln.” A picnic dish, the tart is baked in a spring form pan and carted to the lakes outlying the city in a covered dish and served lukewarm with spicy radish slaw, cold potato salad and a dessert of gingered pears. If you don’t have a spring form pan, a quiche dish will do nicely. 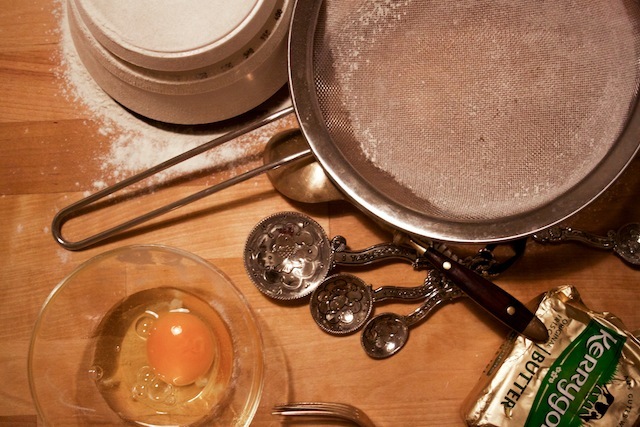 The recipe is adapted from Kitty’s Berlin Kochbuch. Preheat the oven to 425ºF. Sift flour into a bowl and mix in the salt. Break butter up into small pieces with your fingers and rub it into the flour until completely integrated. Whisk the egg and add it to the flour, then knead into a soft dough. Slowly add teaspoonfuls of cold water if the dough is too dry. Roll the dough into a ball, then wrap it in plastic and let it sit in the fridge for 1 hour. In the meantime, clean the leeks and cut them into thin rings. Peel onions and cut them into rings as well. 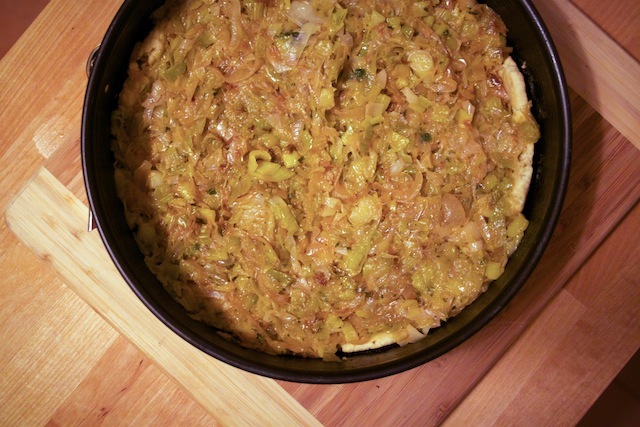 Heat butter in a skillet and sauté the onions and leeks together. When they’ve cooked down, add apple cider and sage (or tarragon) and season generously with salt and pepper. 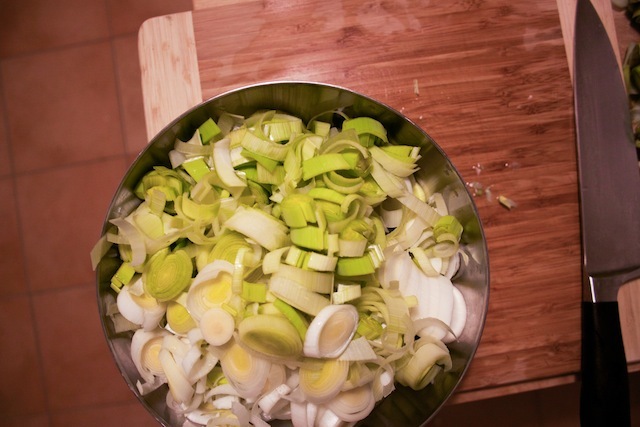 When the leeks have absorbed all of the liquid, take the mixture off the stove and set aside. Wash and dry apples, then peel and thinly slice. Place in a bowl with lemon juice and set aside. 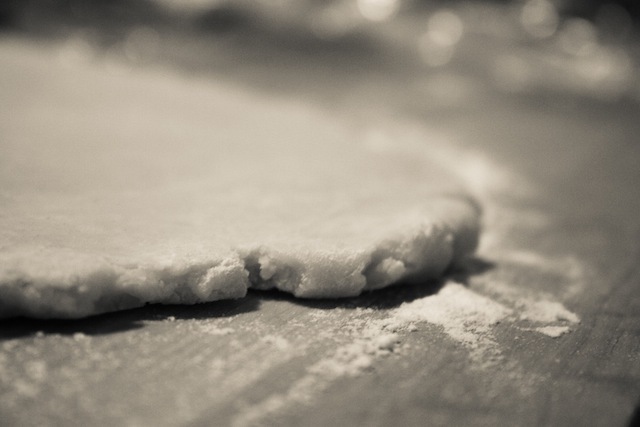 Roll the dough out to a ¼-inch thickness. Butter a spring form pan or quiche dish and add the dough. Poke the dough with a fork in many places, then cover with baking paper. Cover the paper with dried beans or a heavy baking dish for weight and bake for 10-15 minutes. Prepare the sauce: Whisk egg, cream and mustard together, then season with cayenne pepper, nutmeg, salt and black pepper. 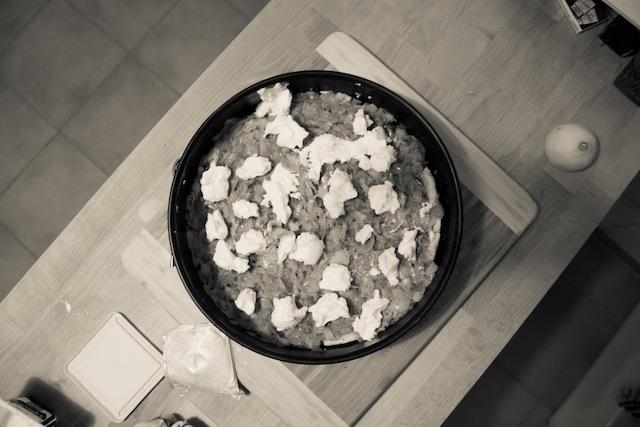 Take the pre-baked dough out of the oven and remove the beans/baking dish and baking paper. Reduce the temperature to 400ºF. Spread leek filling over the dough. Cover with apples and goat cheese, thenServe lukewarm. I would prefer you leave out the cayenne pepper when you feed it to me. Also, I would like the tarragon instead of cloves. 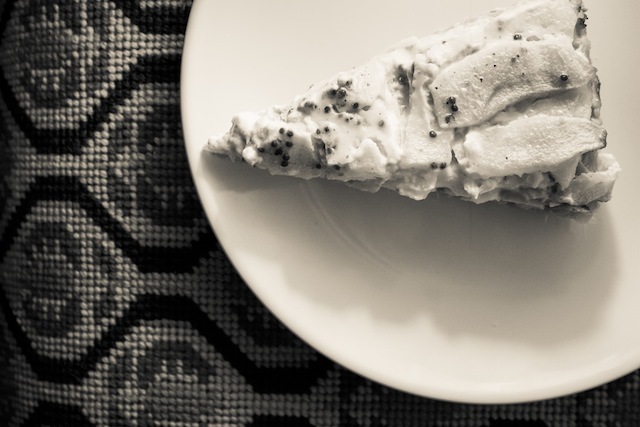 I’m looking forward to a slice or two. Thanks, sweetie.